I'll be the first to admit that the plot synopsis for The Armor of God didn't really do much for me. I quite dislike anime and one prominent feature of many anime shows (at least the ones I've seen) is the inclusion of giant robots AKA Mechs. But being that I knew the author's past writing (check out Wolf in a Gorilla Suit btw), I knew I had to at least give it a shot. God, what a terrible decision. What a piece of garbage. I'm not a fast reader by any means. Sure, I may have a really good time as far as pages per minute but I'd usually lose interest 30 pages in. I often compare my reading-IQ to that of a man with ADD. Unless the narrator is interesting and talks to the me conversationally, I usually lose interest in the regular ho-hum of novelization and am onto something else. All those fears were set aside after the reading the first 30 pages of Book One because something amazing happened... I wanted to read more. I'm not going to get into spoilers (at least not yet) so feel free to read without trepidation. The story takes place in a world where a deadly alien virus called the Laani has taken out most of the human population. Those that remain live in domed cities. A program exists outside the dome that utilizes giant mechs (see earlier description) to kill the Laani. It's simple yet complex, the way any good story is. Mr. Valenzuela does a wonderful job setting this world up without relying on over-explanations; a rarity in the science fiction world it seems. Never did I feel lost in the world being established nor did I feel I wasn't given any information that I needed to be informed of the narrative. The first two chapters help establish a trust with the author as he sets up a world, only telling you what you need to know, a choice we subconsciously take with us throughout the duration of the book. Silly us. While this falls under the Youth Adult flag, it rises above by taking shots at that market, while still catering to it in the process. A love triangle is teased, people are hooking up, and regular tropes are present but it never falls into bad writing. It turns scenarios on its head, pretending to follow the guidelines of standard YA, without ever conceding to the poor writing that usually comes along with it (coughhungergamescough). Don't get me wrong, I didn't enjoy everything about the book. Truthfully, I felt the antagonist was pretty weak. There are several different ones throughout the story but they don't even feel relevant, other than characters telling me how relevant they are. I get that the Laani are a threat to mankind but being introduced to them makes me think I'm missing something, which could be the point. The end introduced someone that could be a great villain, so we'll see where that goes. The characters also tend to meld together as one, which is a bit of a problem. Other than the angsty Akiva, everyone is pretty agreeable. Maybe I just like conflict but I was expecting some more issues to arise during their months of training but instead it's just about everyone becoming better people. Lame. The biggest frustrations of the book come from our flawed narrator Ezra. He has a lot of room to grow and having to go through some of his stupid decision-making is frustrating. I think he may be a reason why the other characters don't make as big of mistakes. Ezra is the one that shouldn't be there and thus the one making all the mistakes. Did I just convince myself that maybe Ezra isn't all that bad? Dammit. The many twists and turns the story takes is what makes the story so good. Every chapter ends with some kind of hook, reeling you into the next chapter with ease. It got to the point where I would end a chapter halfway through rather than at the end because I knew something would happen that would just make me want to keep reading. Just be wary, this book was just recently released and its one of three in a series. So if you think the cliffhanger at the end of each chapter is bad, just wait until you read the ending. It's a doozy. 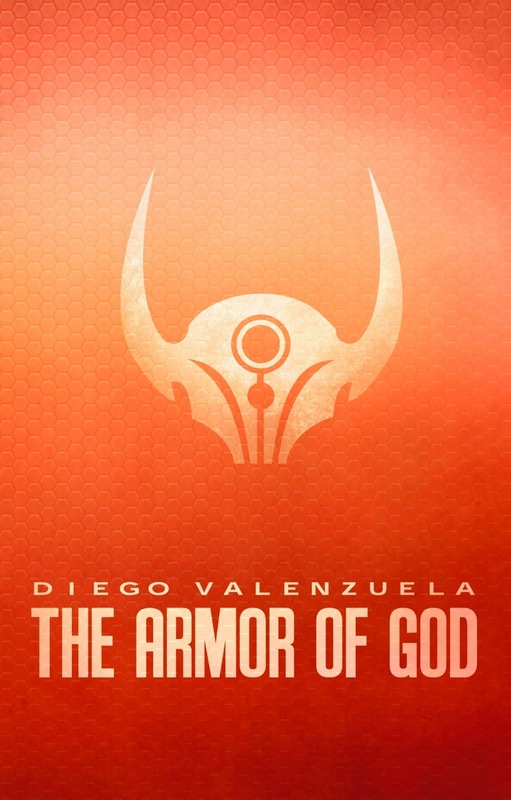 In the end, I really enjoyed The Armor of God. The style of writing and way the plot unfolds lends itself to an intriguing yet easy read. So long as Michael Bay isn't reading this, the epic story lends itself to a big budget action film. I know I conjured up some crazy set pieces while reading it and can only imagine what someone could do with this book on screen. I can't wait for Book Two.